Industrial lighting equipment leader Larson Electronics has announced the release of a fourteen foot telescoping light mast with 360° rotating capabilities. 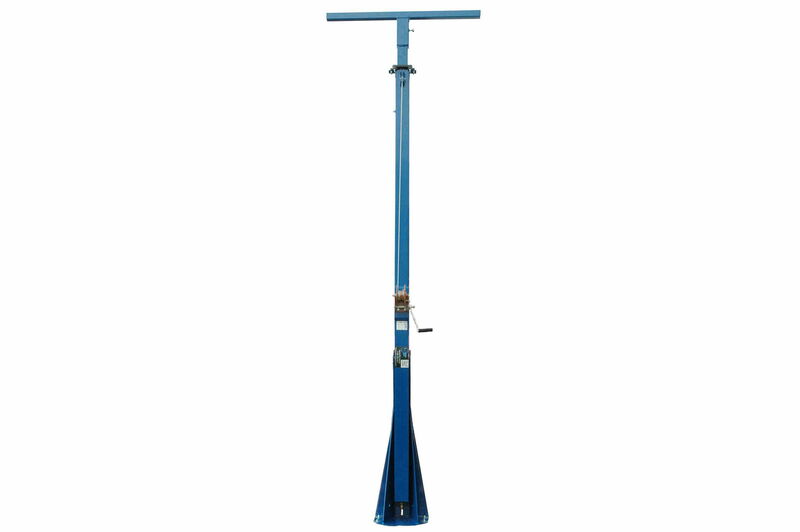 The LM-14-8-FM-500LB is a telescoping two stage steel light mast that provides a safe and effective way for operators to quickly deploy lights, security cameras and other equipment to elevations of fourteen feet. The LM-14-8-FM-500LB produced by Larson Electronics features a five hundred pound max payload rating, a rotating boom that allows for 360° of rotation and a removable mast head for storing mounted equipment when not in use. This light boom can be extended to a height of 14 feet for effective coverage and collapsed to 8 feet. The mast is elevated to its full height with a 2,000 pound hand winch that is fitted with 3/16 inch cable. The 360° rotation is provided by a single T-Handle. By loosening the T-Handle, operators can rotate the mast with ease in either direction. It can be locked into place once the desired position is found by tightening the T-Handle. These light masts are typically mounted to trailers or other stable surfaces by an 18 inch by 18 inch, 3/8 inch thick mounting baseplate which has been predrilled to accept six 9/16 inch anchor bolts. A 44 inch wide and three inch by three inch by ¼ inch thick mounting plate is attached to the upper section of the mast which provides a strong and stable platform for lights or equipment. The mast can withstand winds up to 125 miles per hour, weighs approximately 725 pounds and can easily support and lift five hundred pounds of weight. Larson Electronics produces a full range of industrial and commercial lighting equipment, telescoping light towers, explosion proof lighting, and LED work lights. To view the entire Larson Electronics line of industrial grade lighting solutions, visit them on the web at Larsonelectronics.com. You can also call 1-800-369-6671 to learn more about all of Larson Electronics’ lighting products or call 1-214-616-6180 for international inquiries.